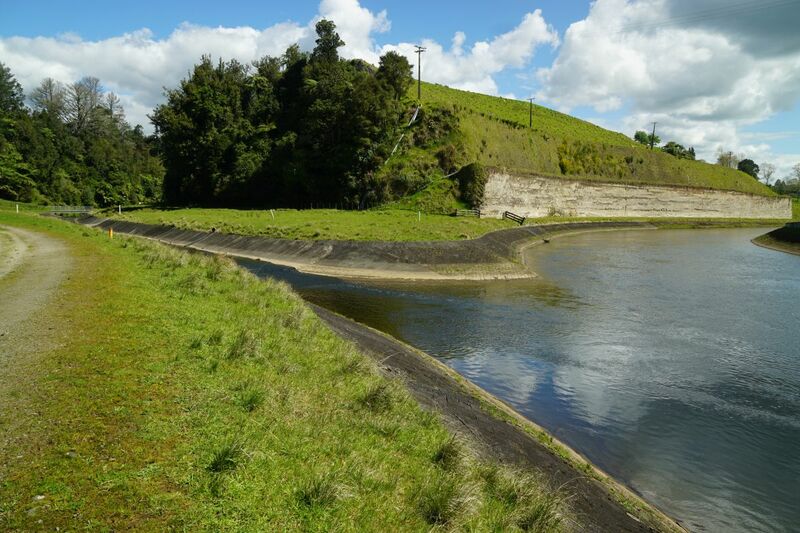 Ruahihi Canal was constructed in the late 1970s and early 1980s to lead water from Lake McLaren and the Wairoa River to the Ruahihi Power Station adjacent to SH29. 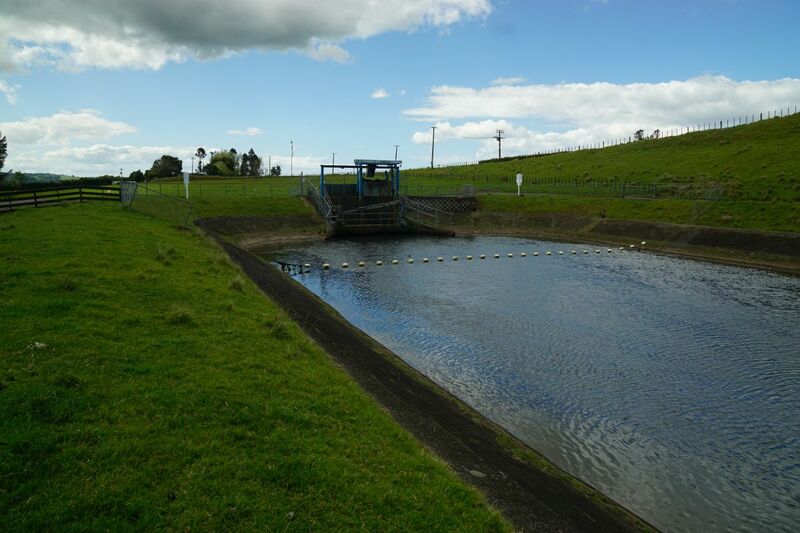 The canal is about 2.5 km long, with water then being fed into penstocks for the final part of the journey to the power station. 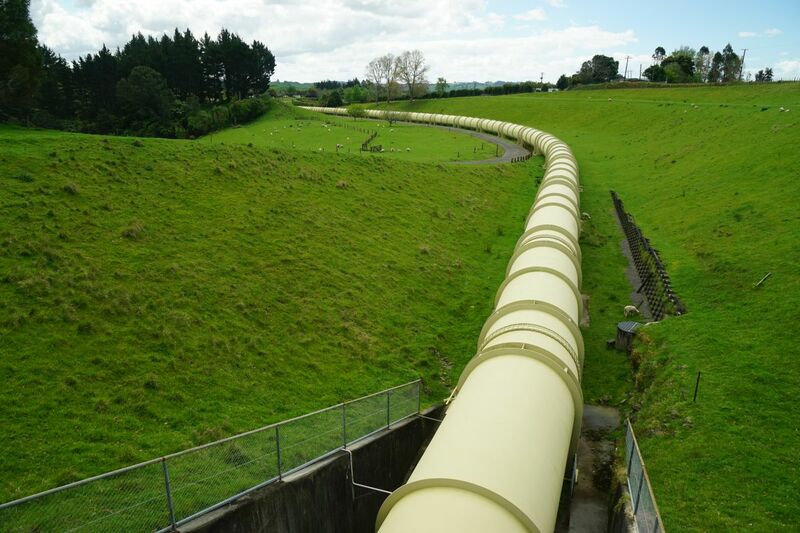 The penstocks are mainly underground, but the single penstock pipe can be followed from the end of the canal as far as Gunga Lane and Ruahihi Road. 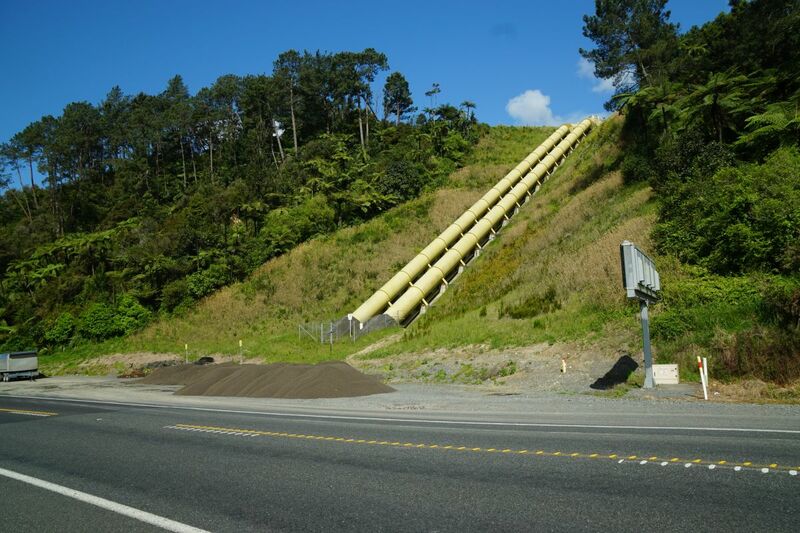 At some point the single pipe is split into the two which can be seen alongside SH29, across the road from the power station. 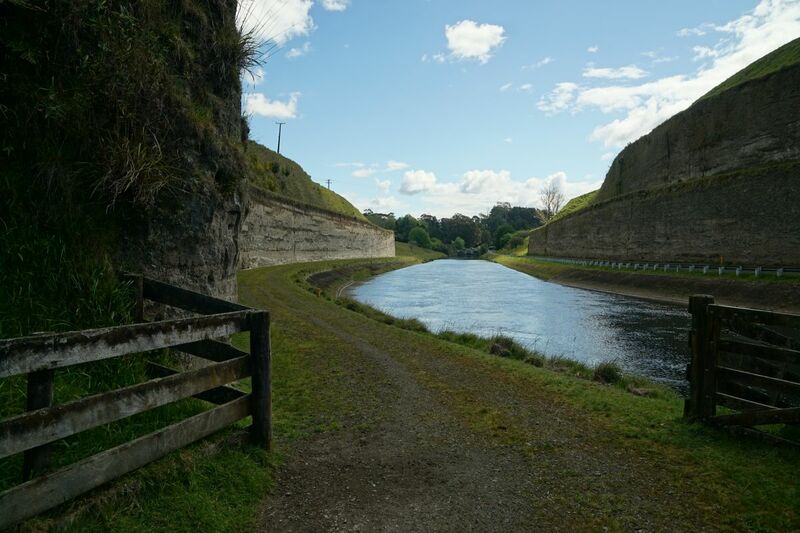 On most days the Wairoa River from McLaren Falls to the power station is only a trickle, but on some weekends the control gates are opened and the river returns to a normal level during the day. The river is popular for white water rafting. 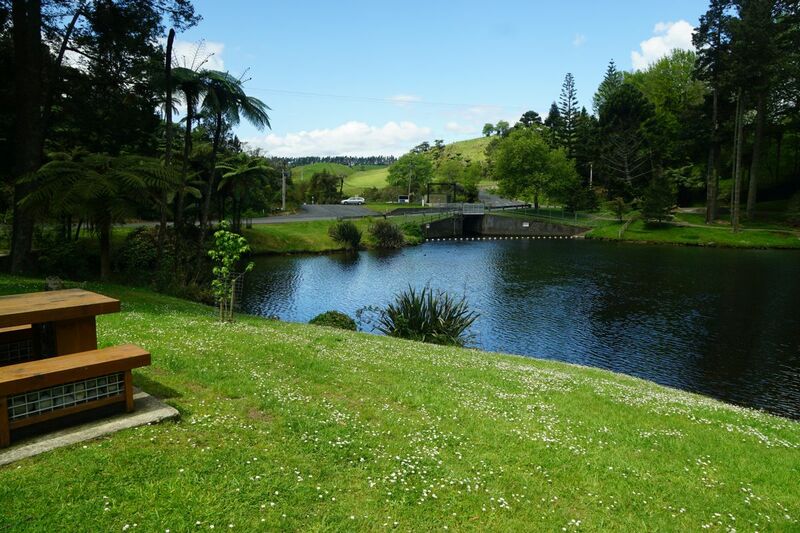 Information about McLaren Falls Park and the river can be found on the Tauranga City Council web site. The page has a list of dates when the river and the waterfalls will be at full flow, but unfortunately it is not always kept updated. 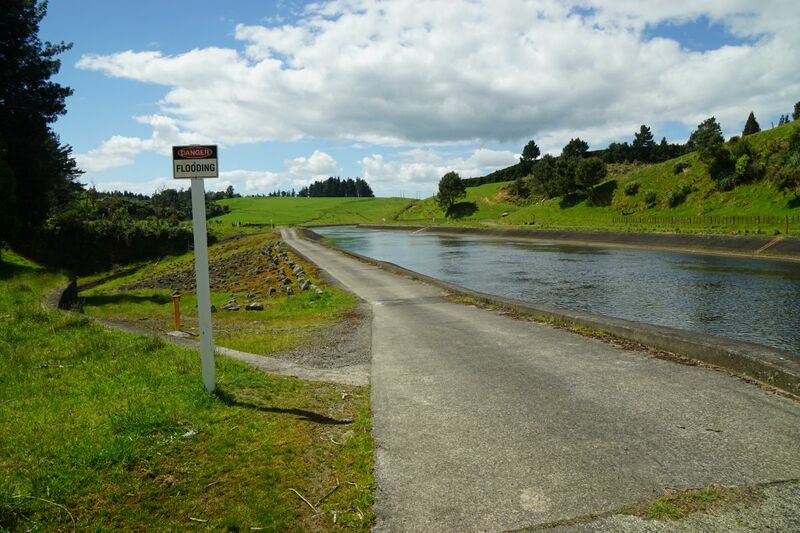 The web site also has information and a map of walks within the park, but only a very brief mention of the Ruahihi Canal walk and cycleway. 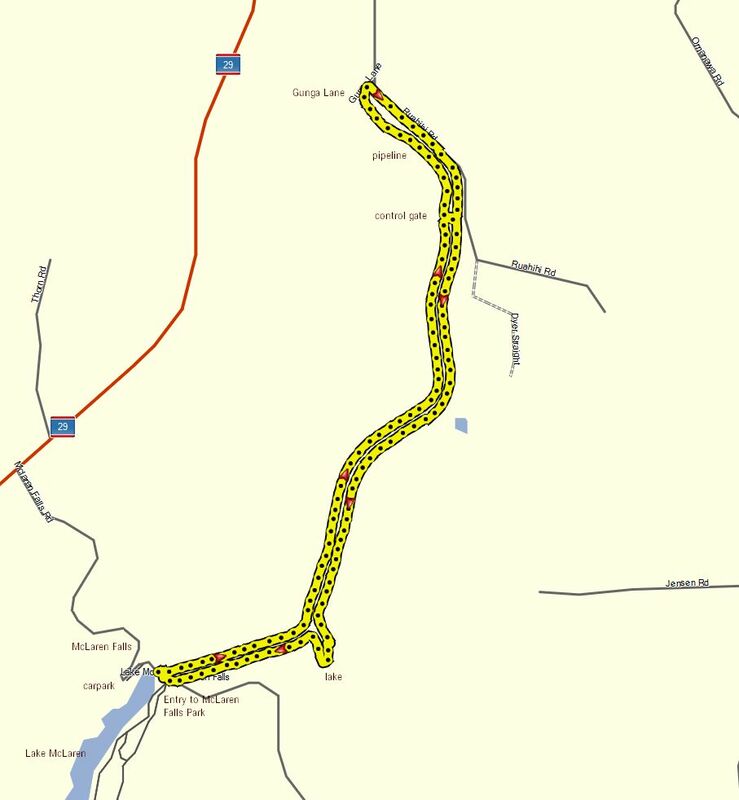 Parking is available on McLaren Falls Road near the start of the canal. The nearest toilets are within the park itself. 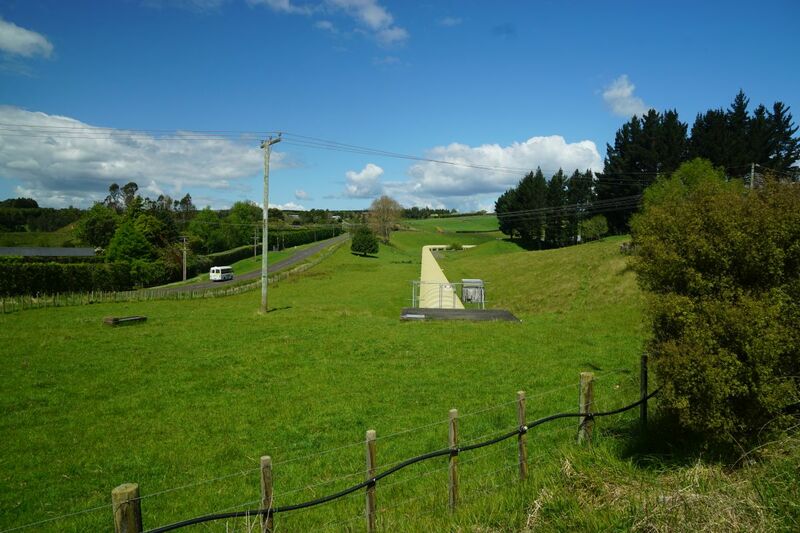 The entry to the canal walk/cycleway is diagonally across the road from the entrance to McLaren Falls Park. There is an old decommissioned power station adjacent to the falls. This was built in 1925, and operational until the 20MW Ruahihi Power Station was commissioned in 1989. 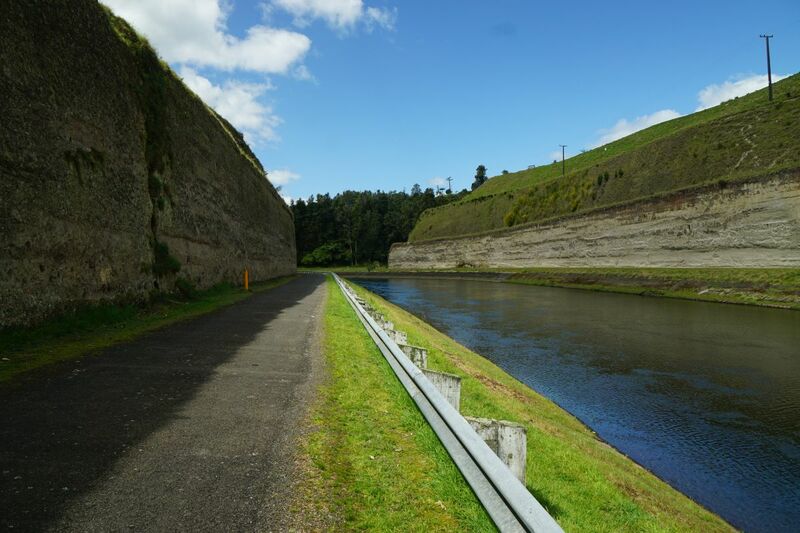 A wide track runs along both sides of the canal, and the canal can be crossed by the control gates feeding into the penstocks, or at the intersection of Gunga Lane and Ruahihi Road. 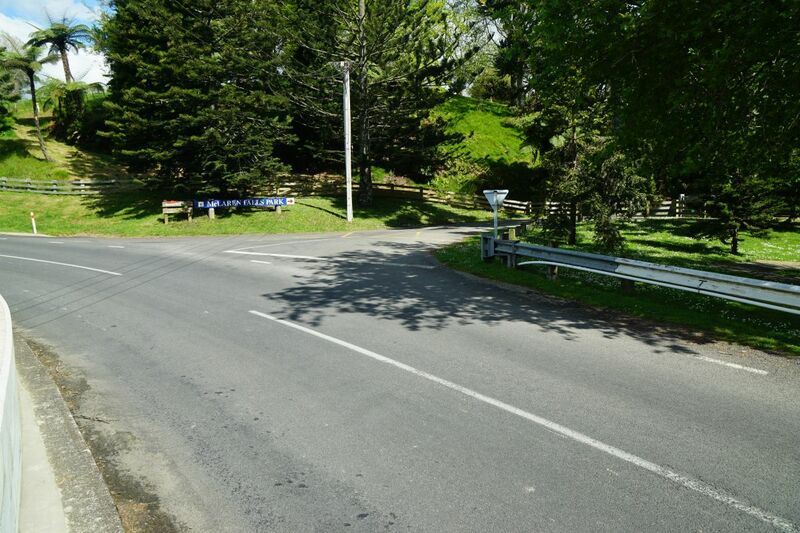 From McLaren Falls Road the return walk is either 5.1 km or 6.4 km, on the tracks which only have a very gentle slope with the highest point at McLaren Falls Road. Fishing from brown and rainbow trout is permitted all year in the canal, but it does require a permit. There is no minimum size, but only two fish may be taken per day. 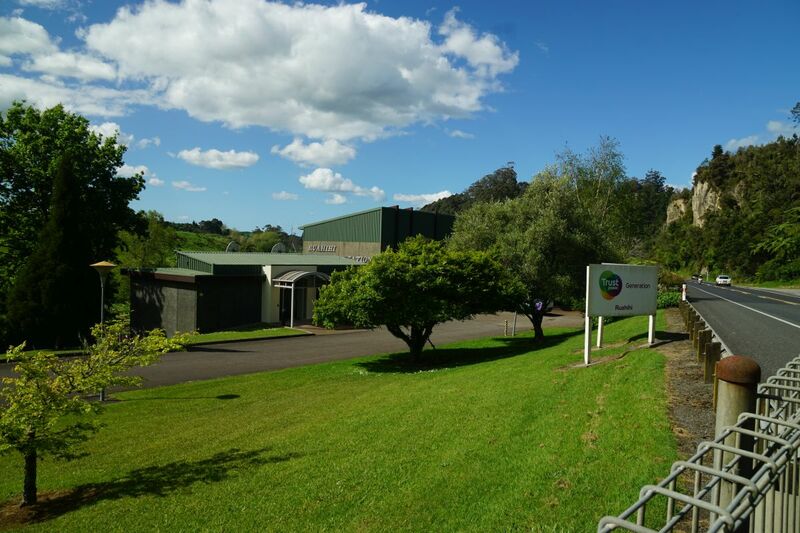 Day licenses are available from sports shops or from the animal park in McLaren Falls Park. 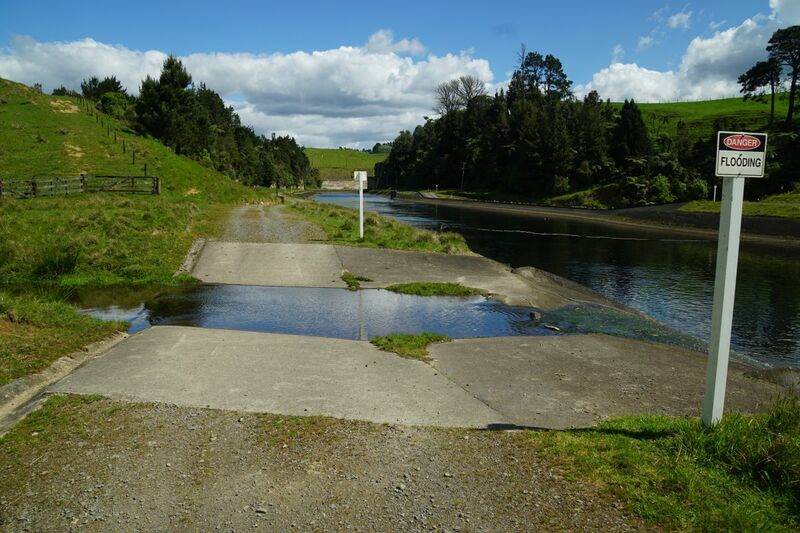 Lake McLaren and the control gates leading into the canal, from the carpark on McLaren Falls Road. The canal track starts where the car is parked, but there are no designated parking spots at that point. The entry to McLaren Falls Park is on the right, on the far side of the lake. The McLaren Falls are only a trickle except for the days when the control gates are opened, or when there has been very heavy rainfall. 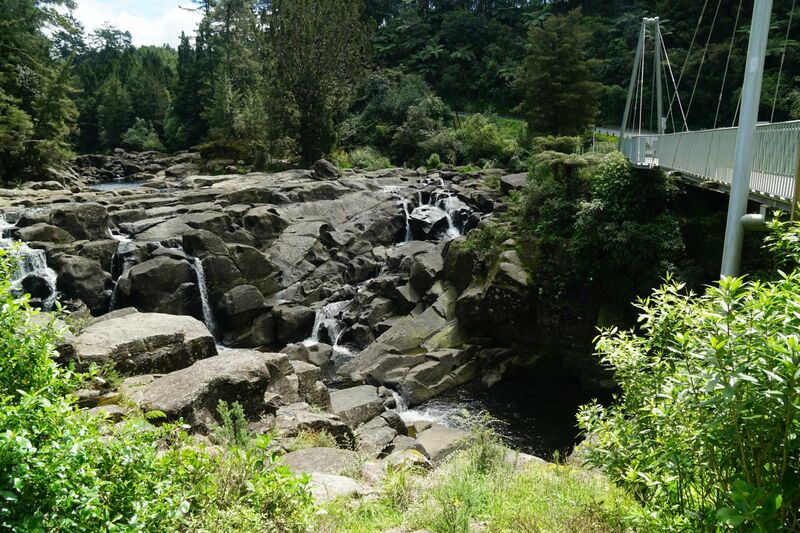 A pedestrian bridge has recently been built alongside the old single-lane vehicle bridge across the falls and the Wairoa River. 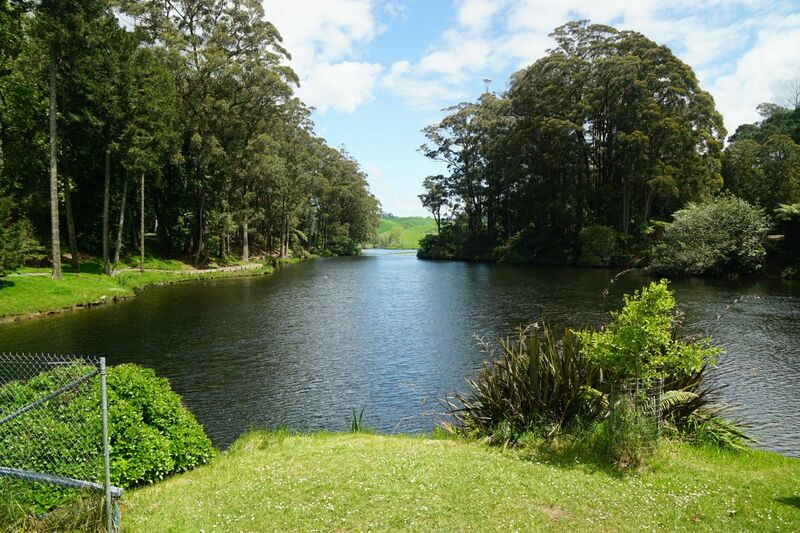 Looking along Lake McLaren from McLaren Falls Road adjacent to the control gates. 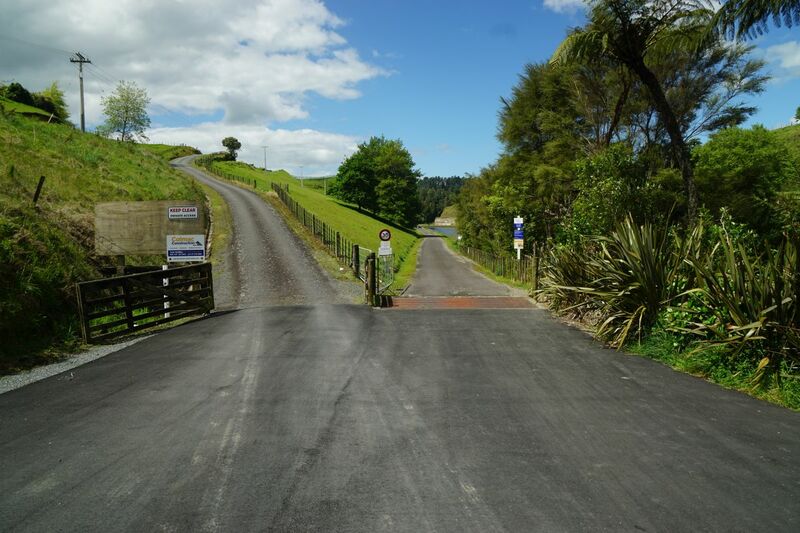 The road entrance to McLaren Falls Park is diagonally across McLaren Falls Road from the entrance to the Ruahihi Canal walkway/cycleway. The entrance to the right is the start of the walkway/cycleway alongside the western bank of the Ruahihi Canal. The driveway to the left leads up the hill to private residences. Part of the canal was formed by cutting through a ridge. The first part of the track on the western side is tarsealed. 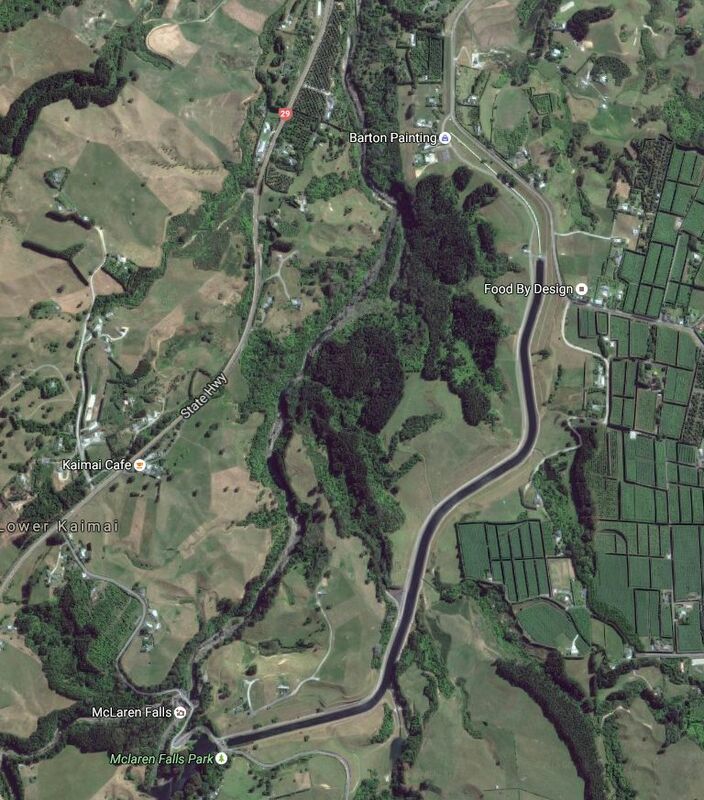 When the Wairoa River is in flood water may spill over the edge of the canal before being led back down the hill to the river. Several aquatic birds have made their home on the canal or the surrounding lakes. 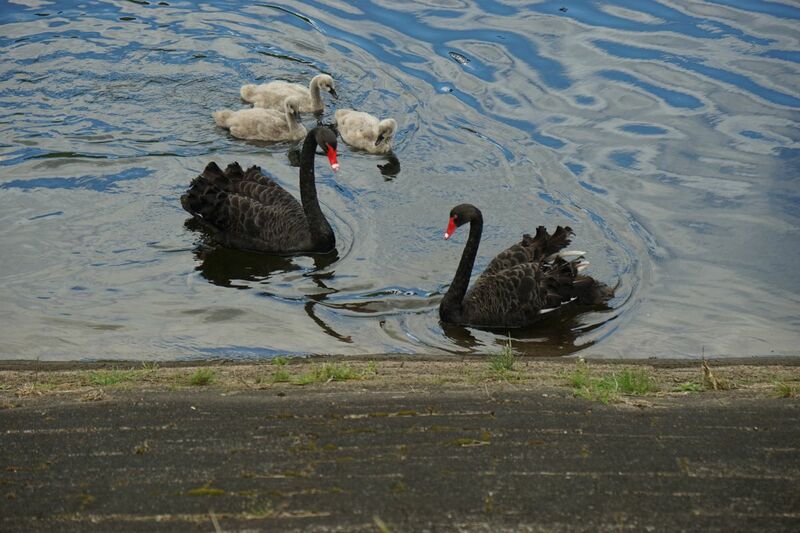 Including these two swans with their cygnets. 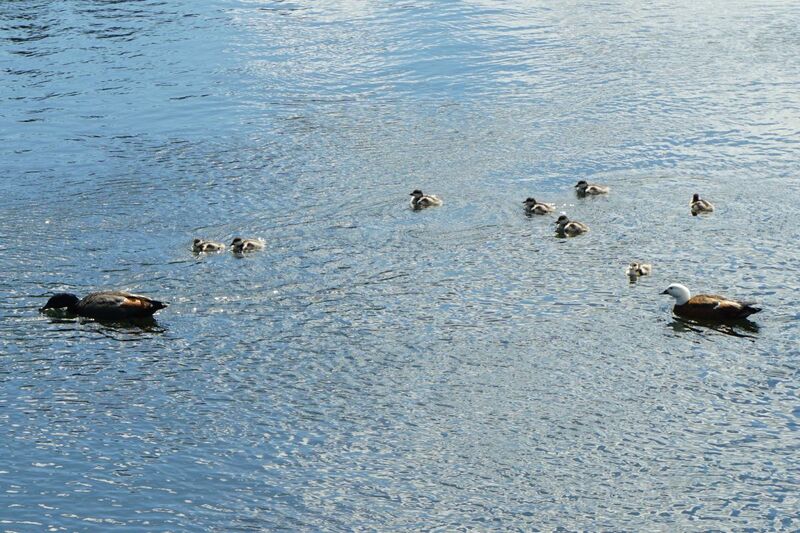 And a pair of Paradise shelduck with their 8 ducklings (or is that shelducklings? or shellings?). The control gates at the end of the canal, leading the water into a single penstock. Looking down the single penstock from the crossing point at the control gate. The track continues down the slope to the left and to the point where the penstock goes underground. Looking back at the penstock from Gunga Lane, with Ruahihi Road on the left. 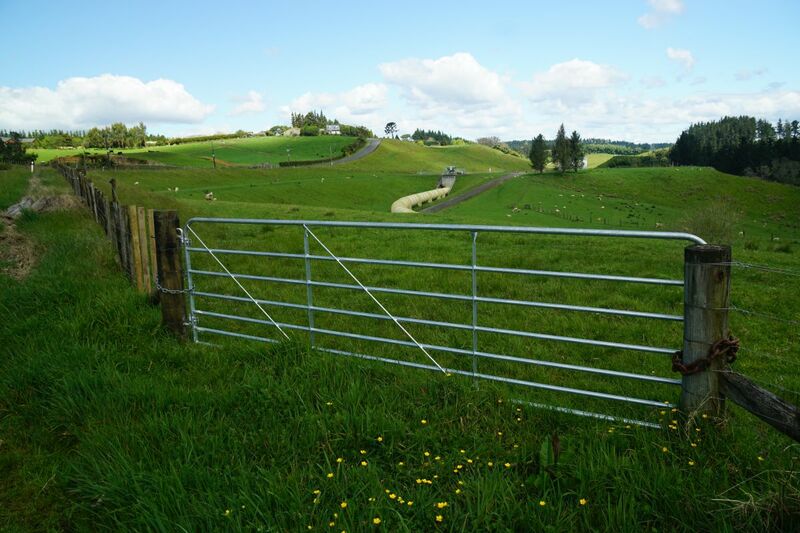 The track can be followed back to the control gate, or walk a short distance up Ruahihi Road before climbing over a locked gate to a track on the left of the penstock. The gate to be crossed from Ruahihi Road is definitely well secured. The track runs along the hillside below the fenceline. The track on the east side of the canal has a few fords that have to be crossed. On this one someone has thoughtfully supplied a couple of stones that can be used as steps. Normally all of the fords can be crossed without getting wet feet. Approaching the cutting on the east side of the canal a branch of the canal heads off to the left, leading to a small lake. There is a small bridge across this arm of the canal on the far left. It’s also possible to cross over at a ford, but the bridge crossing is advisable. Turn right on the other side of the canal to head back alongside the main canal through the cutting. A small picturesque lake with more waterfowl can be seen from the bridge crossing. Heading back through the cutting, on the eastern side of the canal. 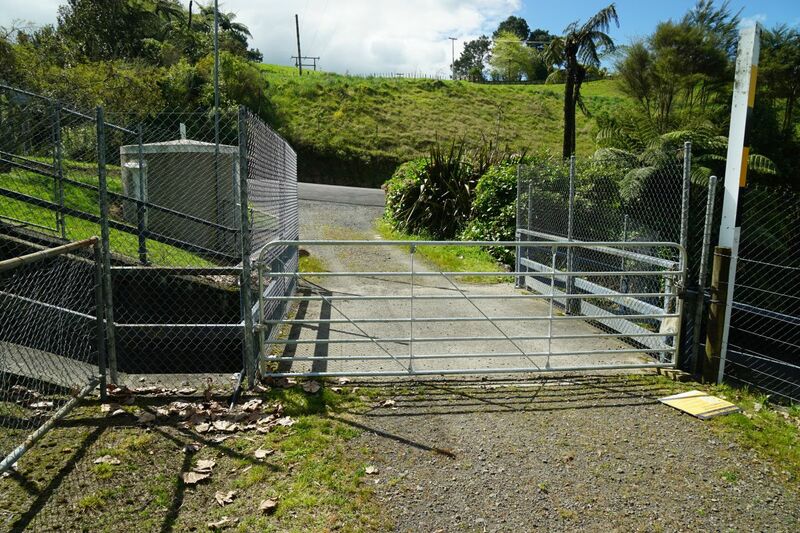 Another locked gate by the lake control gates has to be crossed before returning to McLaren Falls Road. 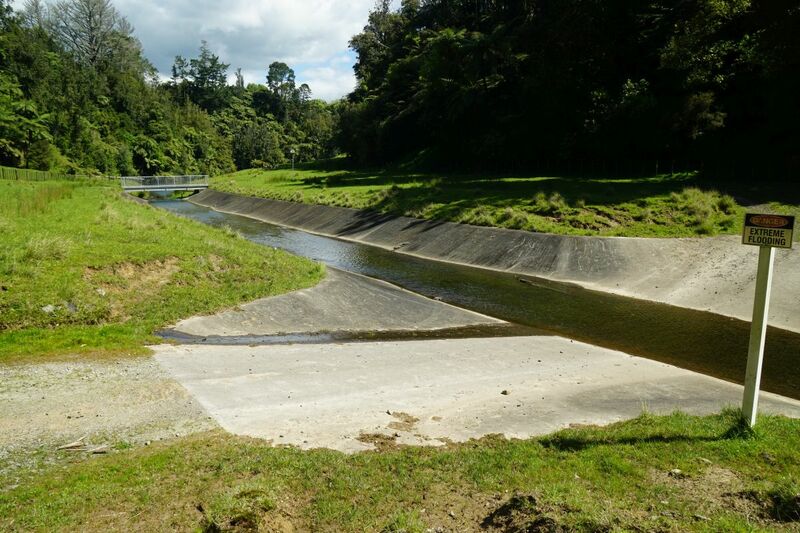 The penstocks adjacent to SH29, across the road from the Ruahihi Power Station. The Ruahihi Power Station seen from SH29. The GPS tracklog shows the route followed, starting and ending at Lake McLaren at the lower left, and walking in a clockwise direction around the canal. Total distance was about 6.4 km and took 1 hour 15 minutes. Crossing over at the control gate at the northern end of the canal would reduce the distance to 5.1 km. A satellite image, from Google Maps, of the area covered by the GPS tracklog. The track was walked on October 27, 2016. 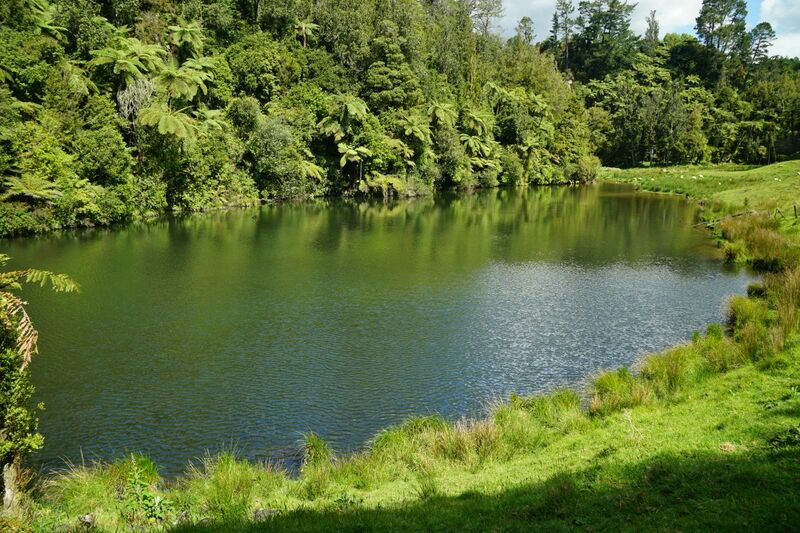 This entry was posted in Walks and tagged Lake McLaren, McLaren Falls, McLaren Falls Park, Ruahihi Canal, Ruahihi Power Station, Tauranga on 2016-10-27 by nzartig. This is great! I have just come across your blog and am already a fan! The dam above in particular has always fascinated me – mostly because of the somewhat mysterious penstock. Fun fact (and I may be a little incorrect on this) – the canal was originally built right up to the top of the double penstock. However, mere months after the dam was commissioned, the canal burst and was in turn replaced with the single penstock. Thanks for this, keep up the good work! Apparently the eastern bank of the canal collapsed the day after the power station was commissioned, on Sunday September 20, 1981. But judging by the aerial photos seen at http://www.delahyde.com/tauranga/pagest/ruahihi_canal_collapse.html there were always buried penstocks leading up to the visible ones by SH29. However the single exposed penstock does look as if it replaces the collapsed part of the canal and forebay.